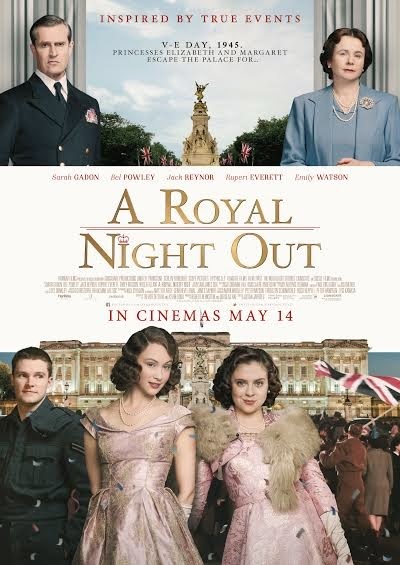 A Royal Night Out; directed by acclaimed UK director Julian Jarrold (Becoming Jane, Brideshead Revisited). is a film about one perfect, glorious evening in the lives of two real-life princesses. Elizabeth and Margaret Windsor are teen princesses as the evenings of 8 May 1945; V-E Night descends on a jubilant Europe. The whole of London is on the streets to celebrate the official end of World War II in Europe. It is known the young princesses, aged 19 and 14, slipped out of the palace to join the communal euphoria and went dancing at the Ritz. Like Cinderella; the princesses apparently returned to Buckingham Palace just after midnight… A Royal Night Out is an affectionate ‘what-if’ story about the adventures Elizabeth and Margaret might have had on the joyous night that brought the whole of London together! To celebrate the release of A Royal Night Out, One Take Kate with thanks to Paramount Pictures has 3 A Royal Night Out in-season double passes to giveaway! Watch the trailer for A Royal Night Out to find the answer to the competition question. Competition Question: Finish Princess Margaret’s sentence from the trailer: “By the way, what’s a ________ ____? This competition closed on Thursday 28th May 2015 at 9:00pm. correctly and have a valid NZ postal address, will be eligible to win. after 9:00pm on Thursday 28th May 2015.
addresses, as listed via NZ Post.